Your Complete Package Includes: The General Policy Manual, Dental Basics Manual, Receptionist Manual, Scheduling Coordinator Manual, Treatment Coordinator Manual, Accounts Manager Manual, Dental Assistant Manual and Hygienist Manual. The General Policy Manual supplies all of the basic policies needed to avoid future upsets and problems between you and your staff. Policies on vacations,termination, sick days, acceptable and unacceptable conduct are all part of the General Policy Manual. Note: The policies contained in this manual comprise general information and guidelines only. Once you edit to your liking, have a local HR professional or your attorney review to ensure you are compliant with state and federal labor law. 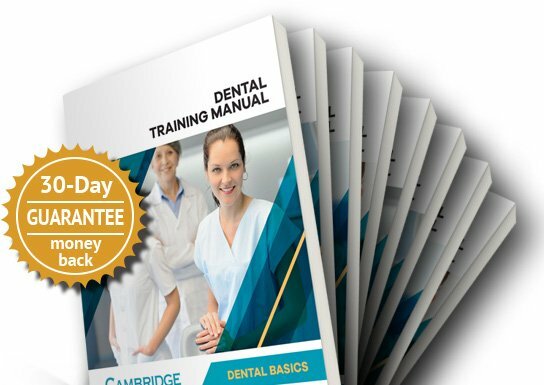 The Dental Basics Manual could actually take someone with absolutely no experience in dentistry and turn them into a knowledgeable dental employee that has the ability to speak with confidence and authority on all the basic subjects of dental care. The Basics Manual includes over one hundred pages with simple to comprehend management terminology and treatment protocols. There is also a section devoted to business and dental definitions. The Receptionist Manual covers the key functions relating to receiving patients at the front desk, the professional way of answering the phones, assisting patients in filling out the new patient forms and how to overall be a dental office’s "traffic cop". In addition, the receptionist must effectively receive and route all communications to all the staff and dentists. This manual includes over sixty policies, forms and checklists. The Scheduling Coordinator Manual addresses the key issues that are faced when it comes to keeping a full appointment book and not just a full schedule but a balance of production that not only keeps the doctor and hygienist busy, but "productive". The responsibility of a scheduling coordinator is to maintain a productive and efficient schedule. A productive schedule includes achieving the production goals for both operative and hygiene schedules on a weekly basis to help meet or surpass monthly production goals. The Treatment Coordinator Manual has been written specifically for the person who does the treatment plan presentations and/or financial arrangements in a dental office and is designed to give them a complete toolset at their fingertips. The responsibility of a dental office treatment coordinator is to ensure everything possible is done to get patients to pay for and complete their individual treatment plans. The Accounts Manager Manual gets into details on verifying insurance, electronic billing, making insurance calls and sending out statements. The best way to eliminate a high accounts receivable is to collect the money before it is overdue. An Accounts Manager works in coordination with other employees, who are intimately involved with collections, such as the Treatment Coordinator and Scheduling Coordinator. The Dental Assistant Manual gets your assistants to make their first priority ensuring they are properly trained and apprenticed to be able to perform all tasks at maximum speed and efficiency. It is one of the most detailed manuals you will ever find. The mission of every Dental Assistant should be to help the dentist in every way possible in providing efficient, high quality dentistry to all patients. Obviously there are policies and procedures that will need to be personalized but our manual has done 90% of the work for you. The Hygienist Manual was not written to teach a hygienist how to clean teeth. But it does cover the basic policies that make it very clear and specific on what is expected from a hygienist as a team member and all the detailed administrative functions that come with this position but are rarely put down in writing as policy. The mission of every Hygienist in any dental office, whether full or part time, should be to provide the best possible oral hygiene care and education to all dental patients.